COMPOSITES EUROPE 2010 took place alongside the ALUMINIUM 2010 World Trade Fair. 294 companies from 25 countries exhibited at the composites event, and 8101 people visited, similar to the last time the show was held in Essen (8061 visitors in 2008). In 2009, COMPOSITES EUROPE was held in Stuttgart, with no co-locating event, and attracted 6451 visitors. This is the last year COMPOSITES EUROPE will be held in Essen. From now on it will alternate between Stuttgart and Düsseldorf (where the biennial ALUMINIUM show will re-locate to from 2012). 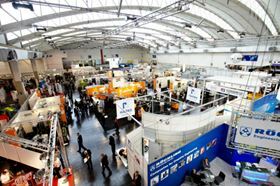 COMPOSITES EUROPE 2011 will take place in Stuttgart on 27-29 September. COMPOSITES EUROPE – the European Trade Fair & Forum for Composite Materials, Technology and Applications – is organised by trade fair organiser Reed Exhibitions in cooperation with the European composites industry association EuCIA and Reinforced Plastics magazine. AVK (the German Federation of Reinforced Plastics) holds it annual conference alongside the exhibition.